Specifically, the new version of the ZenFone 3 Deluxe is model number ZS570KL. That will pair the 821 processor (four high and four low cores with a maximum speed of 2.4GHz) with hardware that was already announced. The 821-packing variant gets even more storage space than the previously-announced variants, a whopping 256GB paired to 6GB of RAM. The ZF3 Deluxe models with the Snapdragon 820 come with 6GB of RAM and 64GB of storage or 4GB and 32GB, respectively. Yes, that means there are three versions of the ZenFone 3 Deluxe, on top of three versions of the ZenFone 3 itself. Try to keep up. Other specs for the ZenFone 3 Deluxe remain the same: 5.7-inch 1080p screen, 23MP rear camera, MicroSD card, dual-SIM capability, 3000mAh battery. 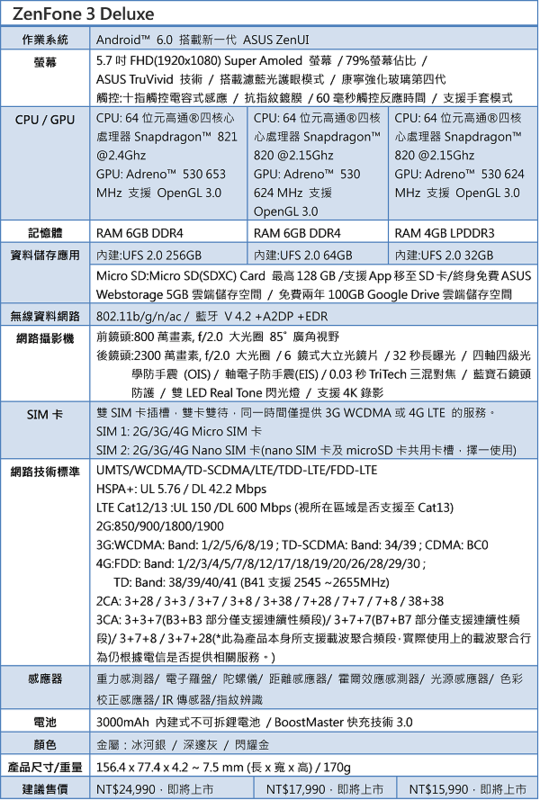 The upgraded version with the 821 processor, 6GB of RAM, and 256GB of storage is priced at 24,990 Taiwanese dollars (approximately $780 USD at current exchange rates), a considerable premium over the two lesser models and 17,990 and 15,990, respectively. The starting price for the ZenFone 3 Deluxe in US dollars was announced at $499 back in May, which is in line with the middle model, so expect this super-powered model to be at least $700 when and if it makes the journey west. It will be sold in Taiwan and Hong Kong sometime after the main August rollout for the ZenFone 3 series.